Paul Black has visited the Ashmolean Museum in Oxford to meet Turner Prize, and 2013 Contemporary Art Society Award winner Elizabeth Price, and view Price’s latest video work; a response to the collections and archives of the Ashmolean and Pitt Rivers museums, in partnership with the Ruskin School of Art, Oxford, where the artist teaches. Price uses images, text and music, informed by mainstream cinema and experimental film, the artist’s practice is mostly concerned with the medium of digital video and its comparative ubiquity in today’s culture. 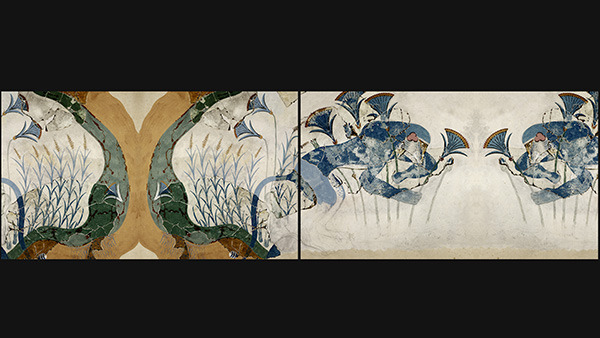 Price’s latest work ‘A Restoration’ is an eighteen-minute-long, dual-screen digital video which employs the Ashmolean’s photographic and graphic archives, utilising the records of Arthur Evans’s excavation of the Cretan city of Knossos. Employing the artist’s trademark melodic and percussive elements, the video is narrated by a ‘chorus’ of museum administrators, and is simultaneously video and installation. Image: Elizabeth Price, A Restoration, 2016 detail. The Contemporary Art Society Award, Ashmolean Museum © 2016. This captivating work begins with a modulated computerised voice: “We are cultivating a garden,” the voice declares, as electronic music is juxtaposed with ancient frescoes of plants, sound building with a celebratory jubilance. Ancient designs spring to life as detailed and beautiful CGI animation, as the ancient is brought back to life and continues its evolution, reminding the viewer that the museum is not the end of the narrative journey for ancient objects, but perhaps a pause. Any visitor to the Ashmolean might imagine the work to be as dusty as they may consider its subject matter, but in fact the work is staggeringly vibrant, with a truly satiating depth. This is a vital and breathtaking exploration of the beginnings of civilisation through design and objecthood, an intoxicating fictional narrative journey through a plethora of ancient artefacts brought to stunning realisation. Price’s video work is the antithesis of our usual ‘expectation’ of tediously self-reflexive video art – which usually leaves the viewer withered and benumbed. The work is in fact expressive and gestural, building to a celebratory swelling crescendo and a revelatory finale. This is a must-see work from the Turner Prize-winner. Elizabeth Price and Paul Black sat down over a cup of tea on the terrace of the Ashmolean Museum in Oxford to talk about the complicated nature of the artist’s fascinating practice, creating one work of art a year, resulting in highly original video works at once contemplative and bombastic. Born in Bradford in 1966, Elizabeth Price lives and works in London. She was educated at the Ruskin School of Art, Oxford and the Royal College of Art, London, and she gained a PhD in Fine Art from the University of Leeds in 1999. She has exhibited in group exhibitions across the globe, and has had solo ￼￼￼￼￼￼￼￼exhibitions at Tate, Whitechapel Gallery, and the British Film Institute, London; the New Museum, New York; and the Musée d’art Contemporain, Montréal. In 2012 she was the winner of the Turner Prize with her work, THE WOOLWORTHS CHOIR OF 1979. Words: Elizabeth Price – with Paul Black © 2016. Lead image: Elizabeth Price, The Contemporary Art Society, Ashmolean Museum © 2016. Elizabeth Price: A Restoration – The Contemporary Art Society Award – Ashmolean Museum – until 15 May 2016.